Published: Nov. 25, 2018 at 02:01 p.m. Published: Nov. 25, 2018 at 01:16 p.m. Published: Nov. 12, 2018 at 10:10 p.m.
San Francisco 49ers running back Matt Breida fools the defense on an 11-yard touchdown catch from quarterback Nick Mullens. 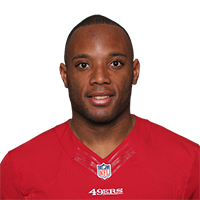 Published: Nov. 12, 2018 at 08:55 p.m.
San Francsico 49ers running back Matt Breida weaves his way for 3-yard TD.